I really hate giving books a “Did Not Finish” rating but usually it just means I didn’t like it enough to trudge through it in order to give it a one-star review. When it gets to that point I wrestle with the concept of reviewing it when I did not even finish it. How can I truly give a review when I never got to the end and in this case, only 45% in? This is my reasoning behind my decision to review it anyway. I am a negative review reader. I want to know what the problem was for some people. Sometimes it is the price and other times it was inconsistencies in plot or poor storytelling. In this case it was a little of everything from characters to plot to mythology. I pretty much had an issue with everything. The story begins with a vampire killing a human. The opening seems like an attempt to set the stage like in many paranormal romances. The reader gets a glimpse of the paranormal elements and the first (or sometimes only) conflict. Quickly the story shifts to Cailey who is having a terrible time with the Christmas classic It’s a Wonderful Life(hence the title). Cailey is attacked by the vampire in the prologue and left for dead. From there she meets vampires and becomes one herself. I pretty much stopped reading right after she became a vampire. At that point I realized I couldn’t stand another moment of the vampire family or Cailey’s ridiculous behavior. I also cared very little for the villain, secondary characters or pretty much anything. Cailey is completely unlikeable and unrealistic in most of the scenes. She whines about the movie and Christmas. She rationalizes walking home in a seedy part of town in the dark because her ride needs five more minutes at work. Frankly I was hoping the vampire would just kill her by this point. She then gets attacked and runs away from the people trying to help her. She rationalizes her need for blood and sensitivity to light in about three paragraphs and just accepts it. She actually formulates a plan to survive, which I respected, but she implemented it horribly. Gabe (the hero, I guess) was also so childish and unrealistic as an ancient vampire I had to put it down multiple times to get over the laughing. Gabe acts like he’s twenty-two years old or younger. He has insta-love with Cailey or at least instant attraction. When she says something about her ‘mentor/sire’ being horrible he gets offended even though it is obvious she is talking about the vampire who attacked her. The entire vampire family is unrealistic. I understand sibling dynamics and I love them in paranormal romances but this was ridiculous. The siblings act like four twenty year olds with little wisdom or actual life experience. Michaela (Gabe’s sister) wants to let Cailey die although she believes in healing people. Metta (Gabe’s other sister) spends the time while Cailey is dying to rhapsodize about the hero. Rafe (Gabe’s brother) is like the kid brother everyone finds annoying. They act like a group of people no one would want to hang around. Not only are the characters unrealistic but events shift so much I couldn’t keep up. Cailey mentions she’s dying and sort of seems like one more breath will kill her. She then spends a few pages discussing Michaela’s research, Cailey’s ex husband, and political correctness in vampire society. If I was dying those would all be the last of my concerns. Also I might want them to start going on and on about how my becoming a vampire saves their butts. The other major issue I had was the technical terminology used. I understand Cailey worked in the medical profession but anything pertaining to medicine was overly complicated and spiffed up to sound pretentious. The author used words/phrases like ‘sphygmomanometer’, ‘oximeter’, ‘subnormal temperature’, etc. As someone who is not in the medical profession this threw me out of the book and made me skim through hospital scenes. Say her temperature is low and they’re monitoring her and then move on please. I had trouble with the writing style and the ‘as you know’ writing. The mythology seemed thrown in to easily explain ‘good vampires’ and ‘convenient plot points’ rather than a real grasp of vampire mythology. I have no problem with creative mythology but it seemed like it was a hybrid of a bunch of different mythologies to the point it made vampires seem normal and humans abnormal. Also the combination of Nyx and Cassiopeia seemed a little too convenient. It left me wishing for better story-building. I struggled on each page to read about Cailey and Gabe. I hated both characters and the situations in the book. When she became a vampire I actually thought it would have been a good ending place. All the book would have required was a quick stand-off between Gabe and Vincent. That was it! That point in the story would have set up another novel and left things shorter. I would have much preferred it. This was not my cup of tea at all. I wish the author had taken a little more time developing the characters and building the world around them. It had potential with the general premise and the idea of the vampire family but if fell way short. It’s been a rough couple of years for Cailey Kantor. Facing her first Christmas alone and bad financial news, she prays for an angel to fix her problems. Instead, a sadistic, sociopathic vampire, with the goal of starting a vampire war, attacks her and forces her to drink blood stolen from the Nosferatu Gabriel Blautsauger. Gabe must complete Cailey’s turning or she will die. In doing so he risks losing his yet unfound soulmate. But something about the lovely mortal speaks to his heart. Once her transformation is complete, he and Cailey find themselves embroiled in a battle that could cost them all they hold dear. Faced with lies, abduction, and betrayal Cailey wonders if the vampire she is falling fangs over heart for is in it for love or if she’s just a means to stop a war. R. E. Mullins was born and raised in Joplin, Missouri. She has also lived in Tulsa, Oklahoma, Mt. Clemens, Michigan, Springfield, Missouri and Colorado Springs, Colorado. Though she has loved each area, the Ozarks hold a special place in her heart. That is why she set her fictional town of Amber Heights there. She worked as a Phlebotomist for ten years and assisted in a Continuing Education Course in Phlebotomy for several years. Now she is concentrating on writing. Visit her at any or all of the links below. 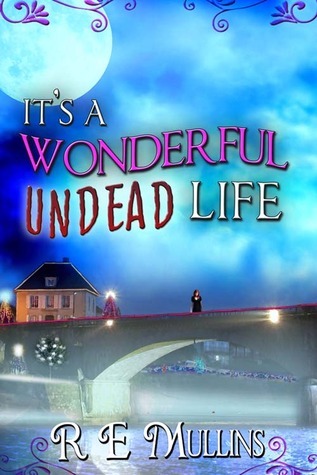 This entry was posted in Guest Review, What We're Reading and tagged book review, discover new books, DNF, guest review, it's a wonderful undead life, novel review, paranormal romance, RE Mullins, reading, the wild rose press, tsuki mew, vampires.